Willow contains a natural hormone --auxin-- in the bark which aids in plant growth. It is due to this naturally occurring chemical that makes willow tree cuttings so easy to root. There is no need for commercially available rooting hormones when growing willow trees from cuttings unless you want the added benefit of a fungicide, which many over-the-counter rooting hormones contain. 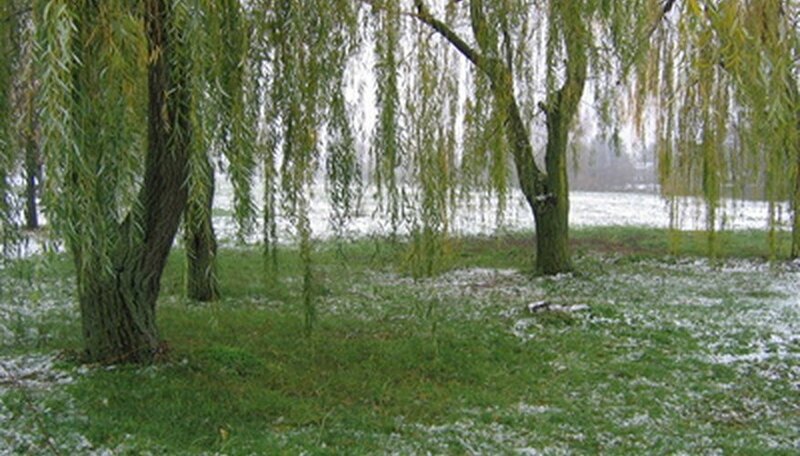 Choose healthy willow trees from which to take cuttings. Snip 6 to 8 inch cuttings from last season's growth in early spring or after the tree goes dormant. Place the cuttings in water until you are ready to plant. Wet potting soil with warm water to the point of saturation but leave no standing water on the surface. Fill the growing tray with the soil and form deep holes for the willow cuttings. Remove the bottom leaves of the cuttings, leaving the bottom 4 inches of the stem bare. Place the basal end of the willow tree cuttings 2/3 of the way into the pre-formed holes of the soil. Firm the soil around the cuttings to secure them into place and remove any air pockets in the soil. Cover the willow tree cuttings with plastic film and secure the plastic at the bottom to create a miniature greenhouse. Move the growing tray into a bright location, out of direct sunlight. If you are rooting the cuttings during the winter, keep the willow cuttings warm by placing a heat mat under the growing tray. Open the plastic each day to allow air to circulate around the cuttings and keep them from growing mold. Reseal the plastic after one to two hours. Check the cuttings after 4 to 6 weeks for any signs of root development. Give a gentle tug of the leaves to feel for any resistance. Avoid pulling on the stems to keep damage of the willow cuttings to a minimum. When you feel resistance, the roots have started developing. Remove the plastic wrap. Transplant the new willow trees into separate containers and allow to grow to a height of 12 to 14 inches. Transplant the willow trees into their permanent location. Water thoroughly over the next several weeks until the trees have become established. If you desire to use a rooting hormone, pour 1 tbsp. of powdered hormone onto a paper plate and dip the willow cuttings, covering the bottom 3 to 4 inches of the cutting before sticking the cuttings into the soil. Avoid planting the willow trees around septic systems or building water sources as the roots may invade the pipes and cause serious damage.